John Anderson (1748-1830) was one of the first Ministers of the Associate Church in America. He was licensed in Associate Church in Scotland and sent to the Associate Presbytery in 1782 during it's time of great need. The legal spirit which prevailed in the General Assembly of the church of Scotland, and seen in its condemnation of the 'Marrow of Modern Divinity' in 1720, very early manifested itself in the most numerous branch of the Presbyterian Church in America. Dr. Anderson was led to preach on the nature of Justifying Faith and at length led him to embody his views on it, in six discourse, in which "The Scripture Doctrine of the Appropriation, which is in the Nature of Saving Faith, is Stated and Illustrated." It has been called 'probably the clearest and most satisfactory treatise on the subject extant in the English language.' It was first published in Philadelphia, 1793. In 1806, Dr. Anderson wrote his Letters in defence of Hervey and Marshall, against the attacks of Mr. Bellamy of New England, who not only opposed, but misrepresented the views of these eminent British divines. This work is entitled "Precious Truth," and is a valuable defence and of the views of the fathers of the Reformation, on the subject of Justification and other collateral doctrines. 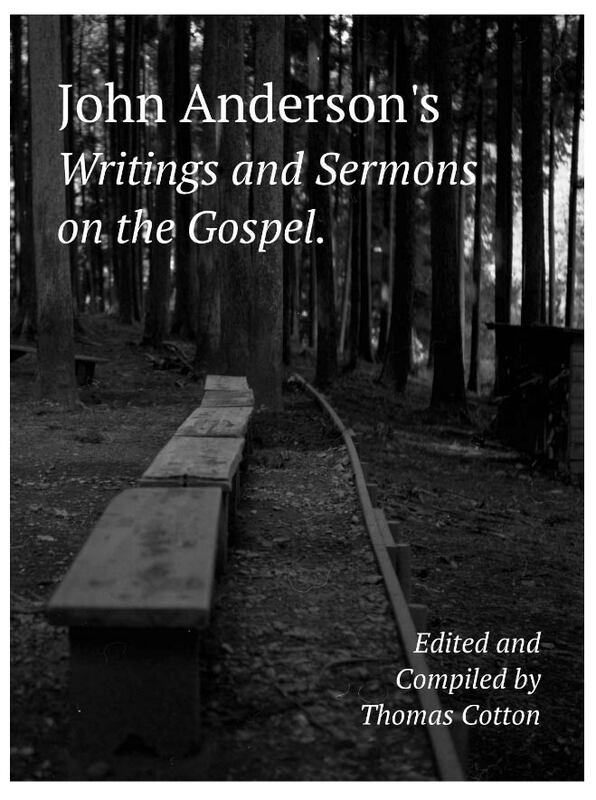 Finally, this collections ends with three sermons of Dr. Anderson and a short letter he wrote to a dying friend. Reader,—Our Lord Jesus directs his people to “go forth by the footsteps of the flock;” and the faith we should seek to obtain, is like precious faith with that of all true believers who have gone before us. It is a great encouragement to hold fast the doctrine concerning the appropriation in the nature of saving faith, which is insisted upon in the following Discourses, that there is a remarkable harmony among the Confessions of the Protestant Churches in asserting it. “We believe,” say the Reformed Churches of France, in the 20th article of their Confession of Faith, “that we are made partakers of this righteousness [of Christ] by faith alone; as he hath said, that he suffered for the procuring of our salvation, that whosoever believeth on him might not perish. And this is the case, when the promises of life which are given us in him are appropriated to our use; and they rendered effectual to us, when we receive them, not doubting, being assured by the mouth of God that we shall not be disappointed.” The Confession of the Belgic Churches, as it was revised and approved by the Synod of Dort, says, in the 22nd article, “We believe that the Holy Spirit kindles true faith in our hearts; which faith embraces Jesus Christ, with all his merits, appropriates and makes him its own, nor ever seeks anything without him.” The Augsburg Confession, article 20: “We are to hold, that the remission of sins is given to us, and of unjust we are made just; that is, reconciled, accepted, and sons of God, freely for Christ’s sake; not for the sake of the worthiness of our contrition, or of any other works going before or following. This benefit is to be received by faith; whereby we are to believe, that, for Christ’s sake, remission of sins and justification are freely given to us.”—“The faith we speak of does not only signify historical knowledge, but the belief or confidence of the promise of mercy, which comes for the sake of Christ the Mediator.” The Confession of the Churches of Saxony, which was presented to the Council of Trent in the year 1551, in the article of the Remission of Sins and Justification, we have these words:—“Faith signifies not only historical knowledge, such as is in devils (for they are said to ‘believe, and tremble’); but it signifies the embracing of all the articles of faith; and particularly of this article,—I believe the remission of sins; I believe that this remission is given not only to others, but to me also. This faith is a confidence, acquiescing in the Mediator—beholding and embracing the promises.” The National Covenant of Scotland:—“We detest and refuse his [Antichrist’s] desperate and uncertain repentance, his general and doubt-some faith.” Larger Catechism of the Westminster Assembly, question 73:—“Justifying faith is a saving grace, wrought in the heart of a sinner by the Spirit and Word of God; whereby he not only assenteth to the truth of the promise of the Gospel, but receiveth and resteth upon Christ, and his righteousness, therein held forth, for the pardon of sins, and the accepting and accounting of his person righteous in the sight of God, for salvation.” To be satisfied that the Assembly mean the same fiducial application of Christ, and his righteousness, as is meant in the other Confessions of the Protestant Churches, the reader is desired to consider their words in connection with the texts of Scripture which they quote, namely, Philip, iii. 9; Acts xv. 11. The faith which is described in the ensuing Sermons, prevailed in the hearts of the patriarchs and prophets, martyrs and confessors, by which they “subdued kingdoms, wrought righteousness, obtained promises.” It is that faith which leads the soul directly to Christ, as offered in the promises of the Gospel, without waiting for any previous qualifications, and to improve him for sanctification as well as justification, by looking unto him for all the endowments necessary thereunto. Discourse I. The ‘Object’ of Saving Faith. Discourse II. The ‘Act’ of Saving Faith. Discourse III. The ‘Act’ of Saving Faith. Discourse IV. The ‘Act’ of Saving Faith. Discourse V. The ‘Duty’ of Saving Faith. Discourse VI. The ‘Effects’ of Saving Faith.